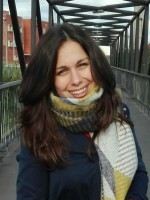 Margarida Martins currently works at the CICECO - Aveiro Institute of Materials, University of Aveiro. Margarida does research in Biotechnology, Chemical Engineering and Chemical Biology. She was involved in the project 'Optimization and Scale-up of Novel Ionic-Liquid-based Purification Processes for Recombinant Green Fluorescent Protein produced by Escherichia coli' as research fellow. Now she is doing a PhD in Chemical Engineering in 'Scale-up of the extraction and purification of phycobiliproteins from Gracilaria sp. and their application as optically active centers in luminescent solar concentrators'. 2018, PLANT FOODS FOR HUMAN NUTRITION, 73, 4, 253-267. 2016, GREEN CHEMISTRY, 18, 15, 4287-4296. 2015, supervised by Flávia Vieira, João A. P. Coutinho, Sónia P. M. Ventura.